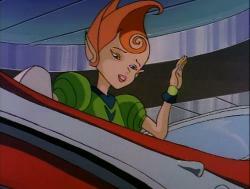 Kala is one of the Neutrinos the Turtles meet in their adventures. Kala, the Neutrino sister from Dimension X. Kala seems to have the strongest bond with Michaelangelo out of all the Turtles. Kala is often shown to be affectionate to Michaelangelo (who likewise had a crush on her), but it never clearly develops into full romantic relationship. In otherwords, the two sort of had a subtle love interest in one another. Kala appears in Heroes in a Half-Shell, Part 2 and Part 3. She’s from another time. She’s from another dimension – Dimension X that is! She’s Kala, the Turtle-trusting teen that’s outta this world. She’s a party-goin’ gal who can hang with the best of ’em. Always in style and ready to fly into action, Kala likes to mix it up with those Foot fellas. With her cosmic comb in her hand and her anti-gravity boots on her feet, there’s no way she can lose. Buddied-up with her other Dimension X plasmic pals, like Zak and Dask, Kala’s a clever kid who likes to help the Green Teens in any groovy way she can. And boy can she! This cosmic cutie has one the hearts of the hard-shelled heroes – they’d even give her their last piece of pizza – if they had one. Kala can be seen in the background of Chrome Domes stage in the SNES version of Teenage Mutant Ninja Turtles: Tournament Fighters.